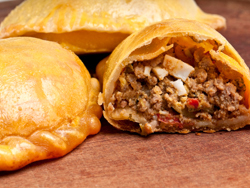 This Mexican cooking recipe of Pork Empanadas are a delicious dough pocket filled with spicy shredded pork and baked to a golden brown. Thank you Maria, this is one of my all time favorite foods to make with the Slow Cooker Mexican Pork. Prepare the Slow Cooker Mexican Pork as directed. Once pork is done add salsa to shredded pork. To prepare the dough, sift together the flour, masa harina, baking powder and salt. Add the shortening to the dry ingredients and mix well. In a separate bowl, beat together the egg and 1/2 cup milk. Make a well in the center of the dry ingredients. Add the egg mixture and stir with a fork until the dough comes together in a ball. Divide the dough into 16 even size pieces and roll each piece into a ball. On lightly floured surface, flatten a piece of dough with the palm of your hand. With a rolling pin, roll out the dough to make a 5 inch circle about 1/8 inch thick. Place 2 to 3 tablespoons of filling in the center of each dough circle. Brush edges of dough with milk. Fold dough over filling. Pinch edges together. Crimp with fork to seal. Place on a lightly greased baking sheet. Bake for 20 minutes or until golden. Remove to rack and cool for about 5 minutes. Serve warm.